Apple has officially joined the smart watch race with its announcement of Apple Watch, the company’s “most personal device ever.” When paired to an iPhone 5+, or the newly announced iPhone 6 and iPhone 6 Plus, users will have access to the major features of their smartphone, but in an experience specifically designed for such a small device’s screen. The clock is at the center of all things on the Apple Watch, and can be customized with 11 watch faces and layouts. These range from traditional analog faces to dynamic options, like an Astronomy face that marks the current phase of the moon, a Solar face (a modern sundial) and more. Depending on the face, these visuals can be customized with additional information, including upcoming events, a stopwatch, sunrise and sunset data and more. Users can navigate menus and launch apps with swipe and pressure-sensitive tap controls, but another control option is available with the Digital Crown. This dial can be used to zoom in and out of maps or photo galleries, for instance, but can also be used to scroll through lists and otherwise navigate through apps without the need for one’s fingers to cover up the screen. As users are expected to wear their Apple Watch all day, every day, the platform provides easy access to “Glances,” or key information like the current stock price, the next meeting on one’s calendar, a user’s current location and more. Apple Watch can also be used to quickly respond to messages, read tweets, access Facebook notifications and many other features, depending on the installed apps. Thanks to WatchKit, Apple’s set of new tools and APIs, developers can create their own “unique experiences” for the platform. Pressing the Digital Crown takes users back to the home screen of the Apple Watch, while pressing the side button on the device brings up the Friends menu for one-on-one contact with another individual. Through the Watch’s Digital Touch capabilities, users can draw sketches, send taps and audio messages that their friends will receive on their own Apple Watch device. Users can even send their own heartbeat to their friends. Finally, Apple Watch offers features for all individuals who wish to track their health and fitness, whether they’re looking to start an exercise routine for the first time or are a professional athlete. The device uses the accelerometer, a built-in heart rate sensor, GPS and Wi-Fi from the attached iPhone to provide an overall look at the user’s daily activity. This includes tracking how much time has been spent completing activities like running and cycling, tracking the number of calories burned, and even the number of minutes one has stood, rather than sat in a day. Users can view their personal fitness histories to create realistic goals for their progress. The program then rewards users for reaching new fitness milestones, in an attempt to keep users motivated to keep going. 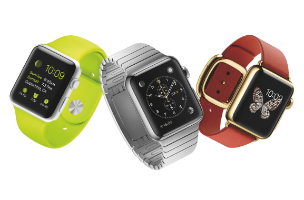 The Watch is compatible with Apple’s recently announced Apple Pay technology, as well as Passbook and Apple TVs. Apple Watch will come in three collections: Apple Watch, Apple Watch Sport and Apple Watch Edition. Each is available in two different sizes – 38 mm and 42 mm. The differences between the models are in their enclosure materials. “The beautifully designed and durable enclosures are crafted from custom alloys of polished or space black stainless steel, space gray or silver anodized aluminum and 18-karat rose or yellow gold,” Apple said in a statement. The watches offer multiple kinds of straps, which can be swapped out to match a user’s personal tastes and needs. For instance, the sports models have sweat-resistant bands. Apple Watch will be available in early 2015, starting at $349 US. Check back soon for more.